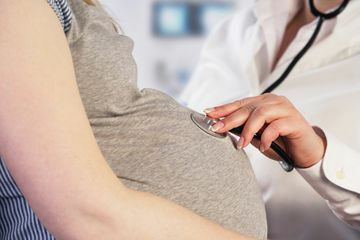 There are new guidelines for pregnant women where doctor's visits are concerned. Here's what you need to know. The World Health Organization has revised its guidelines for pregnant women: According to the organization, women should visit a doctor, midwife, or nurse at least eight times during their pregnancies, and five of those visits should take place during their third trimester. This is a pretty significant change: the organization's previous recommendations advised four clinical visits throughout the duration of a single pregnancy. These new guidelines also point out that qualified midwives play important roles for women who cannot afford doctor's visits or are unable to travel to meet with their physicians. These guidelines just might be the very thing we need to bring down the statistics surrounding maternal death rates. According to a release from the organization, over 300,000 women suffered pregnancy-related deaths last year alone. The statistics surrounding infant mortality are alarming as well: The organization reports that 2.6 million stillbirths occurred, and 2.7 million infants died within 28 days of birth. "The new model increases maternal and fetal assessments to detect problems, improves communication between health providers and pregnant women, and increases the likelihood of positive pregnancy outcomes. It recommends pregnant women to have their first contact in the first 12 weeks’ gestation, with subsequent contacts taking place at 20, 26, 30, 34, 36, 38 and 40 weeks’ gestation," a release for this news reads. Could more frequent medical visits be the key to reversing these stats? It's possible: After all, seeing your doctor doesn't just represent a chance to rule out or address complications, it may also help you better understand how to implement healthier lifestyle behaviors in your day-to-day life. Speaking of lifestyle choices, the organization also released some additional guidelines for pregnant women. They should take daily folic acid pills, have tetanus shots, get blood sugar testing, take antibiotics (if bacteria are detected), and undergo nutritional/fitness counseling. Healthcare providers should discuss issues like smoking/drinking during pregnancy, appropriate course of treatment for day-to-day ailments (think back pain and nausea), and HIV prevention, to name a few topics. The organization also recommends ultrasounds before 24 weeks gestation to determine gestational age and detect fetal abnormalities. You can find a full list of the updated recommendations here—if you're concerned about anything you see here, set up a time to speak with your doctor and possibly schedule additional appointments!